The best brunches are capped off with the perfect cocktail. 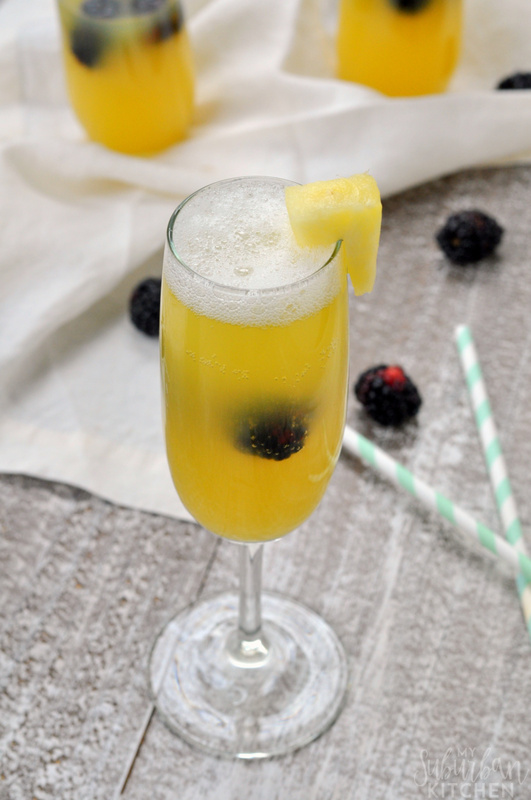 With a pineapple blackberry mimosa, you take a brunch favorite and add a simple twist for an amazing result that will have everyone asking for another round. Everyone loves a classic mimosa. I mean there isn’t much better with brunch than orange juice and champagne. Well, except this pineapple blackberry mimosa. It taskes the classic orange juice and replaces it with pineapple juice. Then, you add fresh blackberries for extra color and flavor. Garnish with fresh pineapple and you have the perfect brunch, bridal shower or girl’s get together drink. 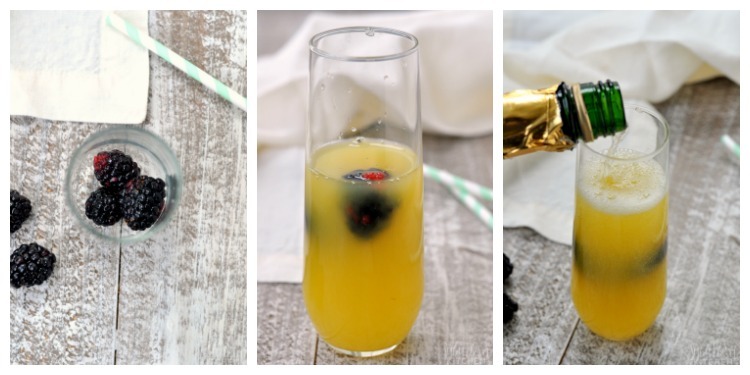 These pineapple blackberry mimosas are super simple to make. You can even partially pre-make them by putting the pineapple juice and blackberries in a pitcher and just top off each glass with champagne before serving. You don’t want to pour the champagne until you are ready to drink though because you’ll lose all the great bubbles. As with pretty much any mimosa, you barely need a recipe for it and you can easily vary the ingredient amounts a little bit based on taste. But, here is how I prefer mine. I like mine with a pretty even split of pineapple juice ane champagne but feel free to adjust that based on your taste buds! 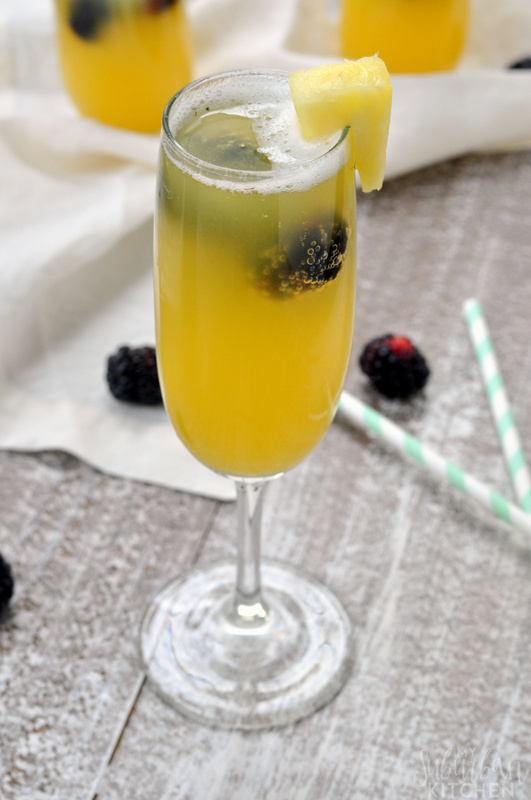 If you make this pineapple blackberry mimosa or any recipe from the blog, I’d love to hear about it. Leave me a comment below or snap a photo and tag it #MySuburbanKitchen on Instagram or Twitter. 1. Add blackberries to champagne flute. Pour pineapple juice over blackberries. Top with champagne. 2. Cut small slit in pineapple chunk and use as garnish for glass. 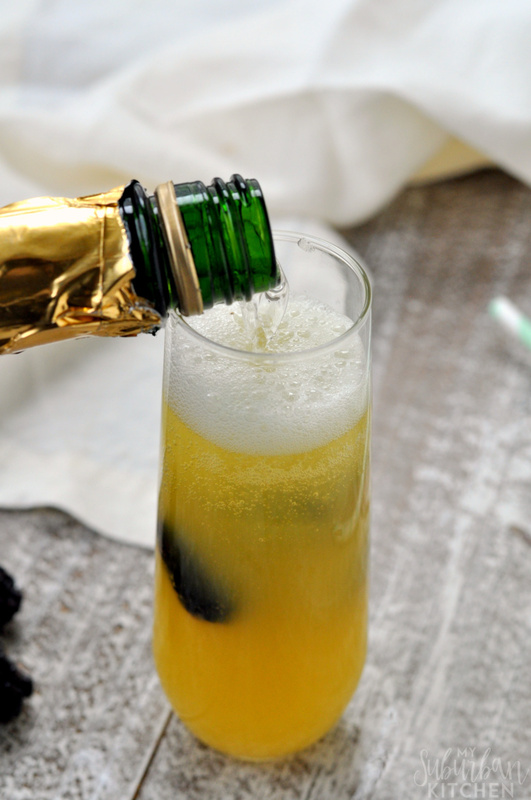 You can vary the ratio of pineapple juice to champagne. I like mine about half and half and this recipe is designed for a 10 oz glass.